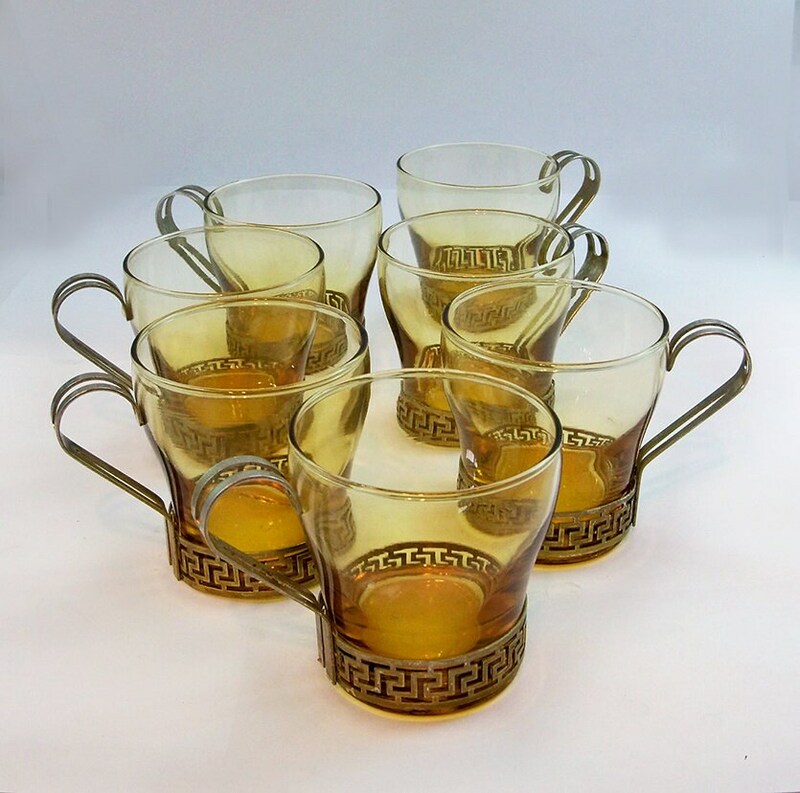 For sale is a beautiful set of seven (7) circa 1970s glass mugs with decorative metal handles perfect for entertaining in retro style. Each of these amber glass mugs hold 8 oz. and measure 3.25" tall and 3" in diameter at its widest point. The gold-tone metal handle features a cut, decorative geometric, Art Deco style, pattern that wraps around the glass. The handles can be removed for cleaning. These mugs are in very good vintage condition with no chips, cracks or stains an look like they have seen very limited use. The metal handles and rings show some wear to the gold-tone finish which has lighten with age but is not very noticeable. $11.95 Flat rate shipping anywhere in USA/USA Territories/APOs for USPS Priority Mail (2-3 day). When you purchase this item you are agreeing to our store policies. Please take a moment to review them. Fast shipping and looks great! Thanks!! Great little vintage beanie, carefully and quickly shipped. Immediate payment is required by Credit/Debit Card or by PayPal. Idaho residents will be charged 6% sales tax. If your state requires sales tax on your purchase, you will be charged your state's sale tax rate. At the Leaping Lemming, We like happy customers! Upon receipt of your purchased item, check for any shipping damage and Convo or email us ASAP if there is shipping damage or other issues. We accept returns on items within 14 days of receipt. If you are returning an item for whatever reason, contact us within 14 days to arrange for a return. Once we receive the item back in good condition, a full refund (less original shipping cost) will be issued to you. Buyer is responsible for return shipping charges and original shipping charges unless we deem that an item was not as described. Returned items must be in original condition with all original parts and be packed well for damage-free shipping. NOTE- We try and describe items as if we were the buyer so carefully read all item descriptions carefully and Convo us with any questions you might have prior to purchasing. Most returns can be avoided if you read sizes, descriptions, etc. I don't know about you but when I order something online, I like to get it get it fast, so It is our policy to ship items as fast as possible. Most items ship within 1-2 business days of a paid order. Items usually ship via USPS or FEDEX Ground. Lighter items usually ship via USPS Priority Mail while heavier items may ship via FEDEX Ground or USPS Parcel Select. If your shipping address is different than your mailing address, please provide us with both so we use the correct one depending upon the carrier. We take great care in packing items but on rare occasions an item can be damaged in shipping. All items shipped within the USA are automatically insured against damage. If your item arrives damaged contact us within 5 days from the delivery date so we can process a claim/refund. We are not responsible for items delivered to your home or business that are lost or stolen after delivery has been confirmed. If you would like us to require a signature upon delivery, please let us know prior to ordering and we will add that option for a nominal cost. We offer combined shipping discounts on most items (see shipping costs on each item). Please note that Etsy handles combined discounts this way: You pay full listed shipping cost on the item with the most expensive shipping cost and then the combined shipping discount applies to additional items (of lesser shipping costs) on your order. We are happy to ship internationally on most items but realize that heavy and/or bulky items will be very expensive to ship so we may note on an item that international shipping is not available.The most cost-effective means for shipping internationally is by U.S. Postal Service (either First Class or Priority International mail) but tracking is often unavailable for items sent this way. International delivery times vary from country to country. An item may take anywhere from 7 to 30 days and occasionally longer and depends upon customs or local delivery delays. We have shipped many items all over the globe with very few problems, but items can get lost or stolen along the way. Should an item be lost in the mail, we will provide you with a copy of the U.S Customs form which is proof that we sent the item. The international buyer will be responsible for contacting their own country's customs/mail officials to trace a lost item's whereabouts. WE CANNOT GUARANTEE DELIVERY OF ITEMS SHIPPED OUTSIDE THE U.S.A.
Also note that the international buyer is responsible for any duty or customs fees charged by your country. The vintage items we sell are over 20 years old (some are much older) and are sold "as is." We do not imply any warranty beyond the 14 day return policy described above. This means that if an item breaks or ceases to function after 14 days of receipt no refund or return option is available. Some large/bulky furniture items may come to you partially disassembled to keep your shipping costs down and we will state that on the item description. The buyer is responsible for correctly reassembling an item. If you have any questions about reassembly or are not certain that you have reassembled properly, please contact us prior to using the item. If you would prefer to have an item sent to you fully assembled--contact us prior to purchasing so that we can provide a shipping cost for a fully assembled piece. Note- some items may not be available for shipping if they are not partially disassembled. 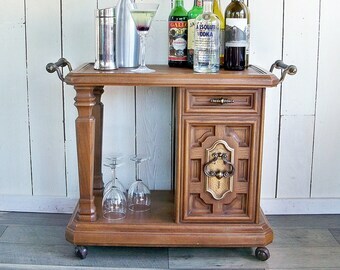 Fully assembled pieces are always available for local pick-up. We attempt to describe items as best we can but be aware that vintage appliances and electrical devices may have electrical hazards so the buyer is responsible for any risks in use of them. Set of 5 Mid Century Mod Better Maid Paper Plate Trays "Great Retro Colors"